Comparative primary texts about Sin and Justice from Mishna and Babylonian Talmud. At Mahlon H. Smith's Into His Own: Perspective on the World of Jesus, Rutgers University. "Fishing for Humans," The Jesus Database, an online annotated inventory of the traditions concerning the life and teachings of Jesus. Dr. Gregory C. Jenks, FaithFutures Foundation. V, 43; Tatian's Diatessaron (c. 150-160). Commentary on a Harmony of the Evangelists, John Calvin, 1558: Matthew 4:12, 17/Mark 1:14-15, Luke 3:19-20/Luke 4:14-15, Matthew 4:18-25/Mark 1:16-20/Luke 5:1-11. "Jesus began to preach in Galilee, after that John was put in prison. If some be laid aside, others shall be raised up, to carry on the same work." "Happy they who follow Christ at the first call!" "Repentance frequently means an inward change, a change of mind from sin to holiness. But we now speak of it in a quite different sense, as it is one kind of self-knowledge, the knowing ourselves sinners, yea, guilty, helpless sinners, even though we know we are children of God." "Begin now: Make the trial. Shake off that outward sin that so easily besetteth thee. Thou canst not. How then wilt thou change thy life from all evil to all good? Indeed, it is impossible to be done, unless first thy heart be changed." "Faith and Repentance Inseparable," Charles Spurgeon, Mark 1:15, 1862. "...that the gospel which Christ preached was, very plainly, a command. 'Repent ye, and believe the gospel.'" "Now after John was put into prison. Mark proceeds to the account of the Savior's public ministry in Galilee. Between Christ's baptism and this occurred the events narrated in John, chapters 2, 3 and 4." Commentary, Mark 1:14-20, Michael Rogness, Preaching This Week, WorkingPreacher.org, 2015. "We believe that God calls each one of us. God not only calls us to follow Jesus, but also calls us into the fields and careers of our lives." Commentary and illustration idea, Mark 1:14-20, Scott Hoezee, Center for Excellence in Preaching, 2015. "Mark allows Jesus merely to appear from out of nowhere, emerging humbly from the heat vapors emanating from the desert floor to be baptized by John. And then at the very moment when we do expect the curtain to rise on the drama to come, we end up in Galilee even as Jesus starts to cobble together a set of followers that can be described only (and perhaps at best) as rag-tag." "Following Jesus Today," David Lose, ...in the meantime... 2015. "...we might ask people to look ahead to the coming week and ask them to anticipate times and places and occasions where they might try to follow Jesus by treating others as we see Jesus treating people." "The Immediately of Epiphany," Karoline Lewis, Working Preacher, 2015. "There is nothing comfortable about epiphanies. They rock your world." "Dangerous Succession," D. Mark Davis, Left Behind and Loving It, 2015. "In the end, this story seems to be Jesus, stepping into the role that John the Baptizer has filled, taking the risk of being aligned with one who was just handed over and proclaiming the same message. Only now we see that this role involves preaching, saying, and walking along the shore to call disciples." "'Let's Catch Some Big Fish!"'" Ched Myers, Radical Discipleship, 2015. "Armchair Travelers" Melissa Bane Sevier, Contemplative Viewfinder, 2015. "We may need to remind ourselves of this obvious fact: not everyone is called to leave the boats and nets, to leave family and place. The vast majority of us are called to stay where we are as we serve God." "Following," Nancy Rockwell, The Bite in the Apple, 2015. "Perhaps the story of any major choice we make can be told in this way: the choice to have a child – and how you live your way into that new identity, and how many times you think you were crazy, and how many times you think it the best thing in your life, and how many times you think it ridiculously difficult." "Gone Fishing," Janet H. Hunt, Dancing with the Word, 2015. "How are you being called to 'leave your nets behind?' What new life might you be being called into?" Visions from the Catacombs, plus podcast, Catacomb Churches, 2015. "New Use for Nets," Lynn Miller, Art & Faith Matters, celebrating our creative and living God by generating art and architecture resources for congregations and individuals. Art and Faith Matters facebook page contains additional resources. "The Call," Suzanne Guthrie, At the Edge of the Enclosure, 2015. "Jesus begins the Journey," Andrew Prior, First Impressions, 2015. Evangelio Comentario del San Marcos 1:14-20 por Heydi Tatiana Galarza Mendoza, 2015. Commentary, Mark 1:14-20, Paul S. Berge, Preaching This Week, WorkingPreacher.org, 2012. "God in Jesus Christ comes to us in our most unexpected moments." "The Call of the Disciples and the Decline of the Church," David Lose, Dear Working Preacher, 2012. "What would make you drop everything and pursue an entirely new life?" "People in the New Community would derive their identity not from their present economic condition or their past familial relationships, but rather be given a new identity as followers of the 'way' of the 'kingdom of God' as taught and lived by their leader, Jesus of Galilee." "Hooking up with Jesus," Peter Woods, I Am Listening, 2012. "How ready are we to encouter people, share our truth and then instead of manipulating, cajoling and trapping them, allow them the freedom to re-enter the waters of life and make up their own minds about the truth we have shared?" Holy Textures, Understanding the Bible in its own time and in ours, Mark 1:14-20, David Ewart, 2012. "The fact that Jesus is out alone at night and that the four all leave their families to follow / travel with Jesus is abnormal and deviant behaviour." "A Call Worthy of Their Lives," Greg Carey, ON Scripture, Odyssey Networks, 2012. "Lots of motives influence people who exchange their old lives for new ones. Harsh new economic realities are forcing people to retrain, restructure, and reorganize." Calling of Simon and Andrew, James and John, audio telling, story in episodes, graphic, audio and written commentaries. Go Tell Communications, Biblical Storytelling for the Global Village, 2012. "Proclaiming What?" Russell Rathbun, The Hardest Question, 2012. "Maybe the good news changes..."
"Following Jesus as though Our Lives Depend on It," Janet H. Hunt, Dancing with the Word, 2012. "Time Fulfilled," Rick Morley, 2012. "'Repent' is part of the poetry of exile, something that the Israelites knew a lot about. Repenting, when in exile, meant going home." Grief and Gospel: The Call, Andrew Prior, 2012. "Somehow, we have to embrace the compulsive, imagination capturing nature of the good news of Jesus, whilst avoiding the abusive potential of netting people who have not been caught by the vision itself." "Who Are Your Fans?" Caspar Green, Scarlet Letter Bible, 2012. "Every endeavor that sets out to change the world, or even a little rural village in upstate New York, or on the Kansas prairies, or a forgotten neighborhood in East LA, or an affluent suburb of Austin starts with three or four people, maybe 12, who have a vision and are ready to leave everything they have to make it happen." Commentary, Mark 1:14-20, Stephen Hultgren, Preaching This Week, WorkingPreacher.org, 2009. Comentario del Evangelio por Doug Avilesbernal, San Marcos 1:14-20 , Working Preacher, 2012. "Jesus Calls Disciples Peter, Andrew, James, and John," Michael A. Turton's Historical Commentary on the Gospel of Mark, "a complete verse-by-verse commentary on the Gospel of Mark, focusing on the historicity of people, places, events, and sayings in the world of the Gospel of Mark." Exegetical Notes by Brian Stoffregen, at Crossmarks. "The two verbs in the second part of Jesus' proclamation are present tense imperatives. That implies continued or repeated actions. "Keep on repenting!" "Keep on believing." Repent and believe are not like a door that we pass through once, e.g., I repented and I believed, so now I'm in the kingdom. Rather they are part of an ongoing lifestyle of the people to whom the rule of God has come near." "Repent and Believe in the Good News," Rev. Bryan Findlayson, Lectionary Bible Studies and Sermons, Pumpkin Cottage Ministry Resources. Includes detailed textual notes. "First Thoughts on Passages from Mark in the Lectionary: Epiphany 3," William Loader, Murdoch University, Uniting Church in Australia. "The calling of James and John and Simon and Andrew functions therefore as a protest not against life at home, but against societal values which trap people into the service of false gods." "Fishing for Christ," Gospel Analysis, Sermons from Seattle, Pastor Edward F. Markquart, Grace Lutheran Church, Seattle, Washington. Detailed background and exegesis. "What does it mean for you to be a fisherman, a fisherwoman for Christ?" Mark 1:14-20 The Beginning of the Good News: the Epiphany Gospels in Mark and John, Paul S. Berge, Texts in Context, Word & World, Luther Northwestern Theological School, 1997. The Dawning of the Kingdom and the Call of the Disciples, A Markan Epiphany: Lessons from Mark 1, Donald H. Juel and Patrick R. Keifert, Texts in Context, Word & World, Luther Northwestern Theological School, 1988. "Time's fulfilled. (Time's Up!?). In Jesus' presence the world enters the Eternal Now." Wellspring of the Gospel, Ordinary 3B, Catherine McElhinney and Kathryn Turner, Weekly Wellsprings. "Conversion and Personal Commitment," Larry Broding's Word-Sunday.Com: A Catholic Resource for This Sunday's Gospel. Adult Study, Children's Story, Family Activity, Support Materials. "How many times have commitments you made changed your daily routine? What commitments have changed your life?" "Good News/Gospel," "Mark 1: Calling of the Four Disciples," "Calling Disciples," wikipedia. Returning God's Call: The Challenge of Christian Living. John C. Purdy, 1989. Full text of book At Religion Online. "Based on passages from the Gospel of Matthew, this book considers what it means to be "called" in a time when Christians have so many competing claims for their time, love, and commitment. Ten challenges to Christian living are explored, among them: calls to adventure, perfection, costly obedience and fidelity." "How to Be a Disciple," Dallas Willard. Adapted from The Divine Conspiracy: Rediscovering our Hidden Life in God. Reprinted in The Christian Century, 1998. At Religion OnLine. "...it could well prove to be a major turning point in our life if we would ... ask ourselves if we really do intend to be life students of Jesus. Do we really intend to do and be all of the high things we profess to believe in? Have we decided to do them? When did we decide it? And how did we implement that decision?" Bartlett, David L., "Conditional Responsibilities," The Christian Century, 1991. Berge, Paul S., "The Beginning of the Good News: The Epiphany Gospels in Mark and John," Word & World, 1997. Derrett, J Duncan M, "ESAN GAR HALIEIS (Mark 1:16): Jesus's Fishermen and the Parable of the Net," Novum Testamentum, 1980. Johnson, Susan B.W., "Love's Double Victory," The Christian Century, 1997. Reumann, John, "Mark 1:14-20, Expository Article," Interpretation, 1978. Spencer, F. Scott, "'Follow Me,' The Imperious Call of Jesus in the Synoptic Gospels," Interpretation, 2005. Trakatellis, Bp Demetrios, "'AKOLOUTHEI MOI - Follow Me' (Mark 2:14): Discipleship and Priesthood," Greek Orthodox Theological Review, 1985. "No Time to Lose," the Rev. Canon Charles K. Robertson, Day 1, 2015. "Our First Calling," the Rev. Julie Pennington-Russell, Day 1, 2008. "No Looking Back!" 22 January 2006, Hubert Beck, Göttinger Predigten im Internet: Every Sunday Sermons based on the RCL by a team of Lutheran theologians/ pastors. "Follow, Follow, Follow," the Rev. Dr. J. Bennett Guess, Day 1, 2003. "Fishing for Christ," Pastor Edward F. Markquart, Grace Lutheran Church, Seattle, Washington. "A Swift Kick and the Window Opens," the Rev. Winifred Collin, Day 1, 1997. Worshiping with Children, Epiphany 3B, Including children in the congregation's worship, using the Revised Common Lectionary, Carolyn C. Brown, 2012. "Storypath Lectionary Links: Connecting Children's Literature with our Faith Story," January 25, 2015, Union Presbyterian Seminary. 2012. 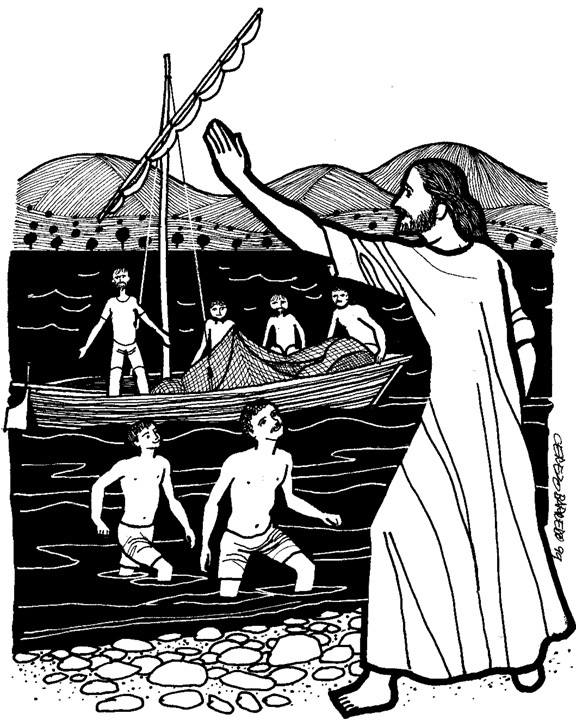 "Fishermen Who Became Fishers of Men," Illustrating the Story (lessons, children's sermons), coloring pages, activity sheets, crafts, children's songs. MSSS Crafts. "Following the Leader," Charles Kirkpatrick, Sermons4kids.com. "Jesus' Disciples Catch Lots of Fish," Sunday School Lessons: Family Bible Study, art projects, music, stories, etc. "Ready to Serve," Jim Kerlin, childrensermons.com. "The First Five," from A Certain Jesus by Jose Ignacio and Maria Lopez Vigil. Ideal for catechetical and liturgical dramatization of today's gospel. Claretian Publications. Clip Art Images: Mark 1:14-20, Misioneros Del Sagrado Corazón en el Perú. Mark 1:14-20, at Cerezo Barredo's weekly gospel illustration. Liberation emphasis. Call of Disciples, Clip Art, Anglican Diocese of Dunedin, New Zealand. “Jesus, You Once Called Disciples,” Carolyn Winfrey Gillette’s hymn celebrates Jesus’ calling of the twelve disciples, along with women and children in biblical stories and calling people to follow today. Tune: IN BABILONE 8.7.8.7 D (“There's a Wideness in God's Mercy”). of disciples to “come and see” and the church’s calling today: “Through gifts of hope and healing, through loving ministry, May we reach out, inviting the world to "Come and see!" Tune: LANCASHIRE 7.6.7.6 D (“The Day of Resurrection”). Hymns with Scripture Allusions: Mark 1:14, 15. The Cyber Hymnal.